January 22, 2011 Sherry Cervi and MP A Man With Roses at the PacWest Barrel Race Buckeye, AZ Jan 22, 2011 Ran a 16.646 which is a record in that arena. They were so close to beating the world record of 16.643 (watch it below). Here is what is said to be the World Record on a standard pattern. (standing as of of Jan 22, 2011. This Nicole Aichele running a 16.643 on Biankus French Girl, May 31st, 2010. Pattern size verified after the race. Check out this new video – a record setting run on a standard pattern. Set by Barbara Merill at the Buckeye Equestrian Center in Arizona during the Greg Olson Memorial Futurity. This horse was in the Maturity. Proud Red Pepper is the horses name. By Proudest Effort out of a Dash Ta Fame daughter. Wow! 16.653!!!! Wow! Here is Tanya Steinhoff and Hot Shot at the Lazy E Arena in Guthrie, OK in 2002 at the Oklahoma American West Regional. This was a standard pattern and it was measured AFTER the barrel race to ensure that indeed it was correct. Smokin run….. 16.644. Fastest run on a standard pattern. Here is an awesome video of futurity and derby winners, 2009 NFR Qualifiers Sue Smith and Real Claim to Fame “Claimer”. In this video they make a winning run at Spanish Fork UT PRCA rodeo. I had the pleasure of riding with Sue for a few hours in Arizona in February. She is a great lady with so much to share. She gets her horses broke! Here’s really great collection of barrel racing video showing us what its all about. A nice watch to get you going! I love Sherry Cervi’s Barrel Race on MP A Man With Roses! My favorite barrel racer is Sherry Cervi! does any one know what the measurements of the westpac barrel race buckeye course is? You’ll want to get your horse light and responsive to your cues. When you ask to move – he does. There are many drills you can do (like the “pick up and move” drill to help with this problem. 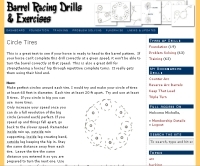 Check out http://www.barrelracingdrills.com for more solutions.